DES MOINES – Offensive Lineman Mitchell Bell accepted an invitation to the Carolina Panthers rookie minicamp, Iowa Barnstormers Head Coach Dixie Wooten announced. Bell (6-4, 330, Louisiana Tech) received an offer to attend the Carolina Panthers rookie minicamp after attending the Spring League, an instructional development program for professional football talent. Bell will join 34 other athletes to tryout for the NFL franchise. Last year, the Panthers signed six tryout players to their 90-man roster, the team currently has three open spots. Bell joined the Iowa Barnstormers for his first season in the Indoor Football League (IFL) back in February. In 2015, Bell was signed to the NFL as an undrafted free agent by the Oakland Raiders. Bell was waived by the Raiders in the final cut down, but earned a spot on the practice squad where he ultimately finished out the season. Collegiately, Bell began his career at Navarro Junior College before transferring to Louisiana Tech where he played for two years. In 2013, Bell appeared in 11 of 12 games as a Bulldog, earning the start in eight. Bell was named 2013 Honorable Mention All-Conference USA. Former Barnstormers Kicker Josh Gable is also getting his shot at the NFL. Gable was invited to attend the New England Patriots rookie minicamp after his trick shot videos gained attention. Since heading to the minicamp, Gable has gained national attention getting mention on FoxSports and ESPN. Gable first joined the Barnstormers in 2015 for his rookie season in the IFL. Gable appeared in 6 games with the Barnstormers in 2016, before joining the Nebraska Danger. The Iowa Barnstormers are off to their best start since 1996 with an 8-2 record and a 6-game winning streak. The team faces in-state rivals the Cedar Rapids Titans this Saturday, May 13 at Wells Fargo Arena. 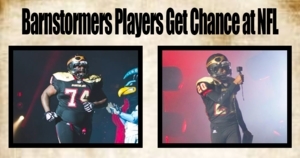 Kickoff is scheduled for 7:05 p.m. For more information, call the Barnstormers at (515) 633-2255 or log on to www.theiowabarnstormers.com.